In simple terms, Rollover is carrying forward a particular month’s futures positions to the next month. This is done by closing the existing futures position of the current month and simultaneously taking a similar position in the subsequent series. Ideally, traders roll their positions in the last week of the expiry series, typically on the expiry day. On the expiry day, traders have an option: they can either let their position lapse or enter into a similar contract expiring at a future date. For example, if you are bullish on Nifty, you can rollover or carry forward the Nifty future position by closing your original position which is due to expire and simultaneously initiating a buying position for the subsequent month’s contract. A separate spread window on the trading platform provides spreads on the future contract (i.e difference between current series and next series rates) which can help traders to execute rollovers more efficiently. Why to do a Rollover in Future contract? As an option contract provides a right and not an obligation to hold the underlying asset, while the future contract provides a promise, so it is beneficial to make rollover in futures vis-à-vis options. Expect the current trend to continue in the near future. Not willing to book losses and expecting the trend to reverse from the current situation. Cash & Carry arbitragers who take hedge positions by buying a stock in the spot market and selling it in the futures market. Reverse Cash & Carry arbitragers with delivery holdings would sell their holding in cash markets and buy back the same in futures. What is the cost associated with a Rollover? Positive Rollover yield: A short seller in a contango market where the future price is quoting above the spot price will have a positive rollover cost as the next series contract will trade with a premium. The contract will be available to get rolled at a higher price vis-a-vis current series contract, yielding an incremental positive spread. A trader with long positions in backwardation market where the future price is quoting below the spot price will also have a positive rollover cost as the next series contract will trade with a discount. The contract will be available to get rolled at a lower price vis-a-vis current series contract, yielding an incremental positive spread. Negative Rollover yield: A trader with a long position in contango market where the future price is quoting above the spot price will have a negative rollover cost as the next series contract will trade with a premium. The contract will be available to get rolled at a higher price vis-a-vis current series contract, yielding a negative spread. A short seller in backwardation market where the future price is quoting below the spot price will also have a negative rollover cost as the next series contract will trade with a discount. The contract will be available to get rolled at a lower price vis-a-vis current series contract, yielding a negative spread. OI: Open interest refers to the total number of open contracts on a security. Where to get Rollover data? Rollover data is not readily available on the websites of the exchanges and is calculated by traders who do so by putting together final figures by extracting data from the Exchange Bhav copy. Rollover is expressed in terms of total number of contracts as well as percentage of total positions getting rolled to the next series. Rollover is interpreted by comparing current series rollovers with its historical averages typically 3m, 6m & 12m average rollovers. Broadly, Rollover is an indicator of traders' willingness to carry forward their existing bets on the market. But the standalone figures will not tell you in which direction traders have placed their bets. On most occasions, lower­ than average Rollovers signal uncertainty as well as unwinding of current trend, while the higher rollovers signal conviction of the current view which can lead to a continuation of current trend. 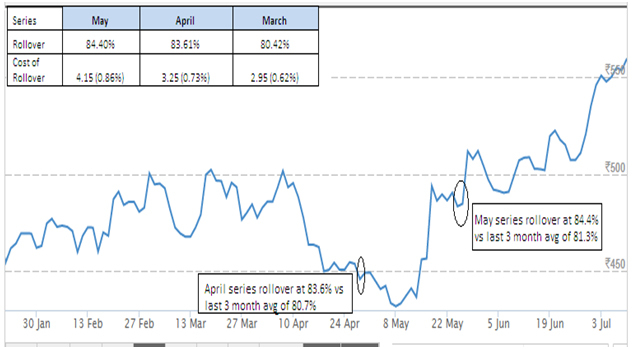 Hypothetically, if Rollover in Nifty futures from May series to June is at 70% and its past three ­month average Rollover is 64%, it means that traders are more convinced with the current market trend by building more positions. However, at times, tracking Rollover trends based on just percentage terms can be misleading; it is always better to see it in terms of total contracts/shares getting rolled too. For instance, 70% Rollover may have taken place at a lower base of open interest—number of outstanding positions —while average of 64% rolls would have been happened at a relatively higher open interest base., Therefore, analysing Rollovers purely on the basis of percentage terms can lead to faulty analysis, and hence trades should also track Rollovers in terms of total contracts rolled and also analyse Rollover trends on the basis of Rollover cost. Usually, high Rollover cost signals that the mood is upbeat in the market. How to use Rollovers to spot hidden gems? From March to May 2017, Tata Steel had witnessed a commendable surge in Rollover and Rollover cost. In terms of Rollover, the stock saw an increase from 80.4% in March to 84.4% in May. In the same period, ~3 Cr shares were rolled in May as compared to ~2 Cr shares in March while the Rollover cost surged higher to 0.86% from 0.62% indicating that the stock had formed bullish positions. 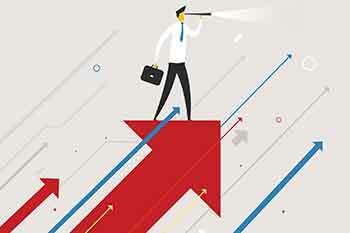 On the last day of May F&O series, the price was at Rs 484, and derivative traders who had identified and analysed these positions could have taken long positions in this stock. It would have been advantageous for the traders as Tata Steel price gained 10.5% in June F&O series.